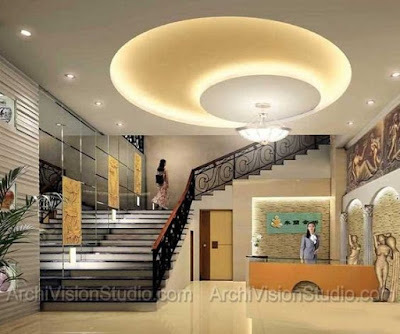 Properly made lighting can advantageously emphasize the strengths of the design solution. 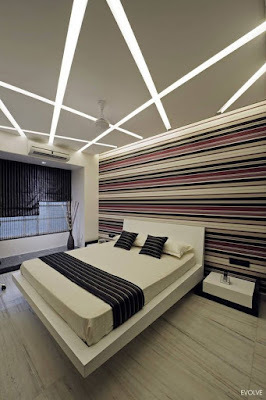 The room can be transformed by the use of light. The most common are false ceilings with lighting. You can make them yourself, using plasterboard that will hide all the shortcomings of the ceiling surface, even global ones. 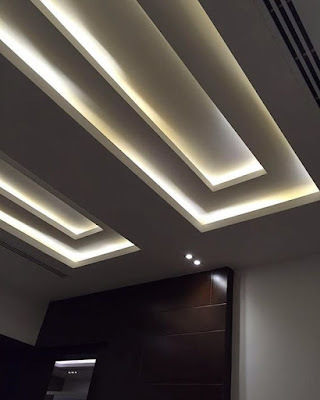 You can make a multi-level false ceiling, with inserts and transitions. That is, the master can embody his boldest ideas. 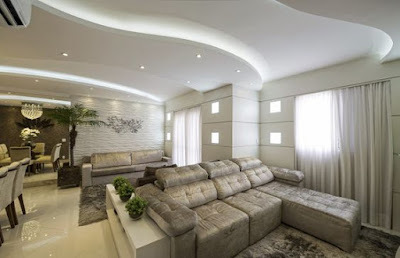 The backlight, which can be built, can create a cozy room in the room and emphasize originality. 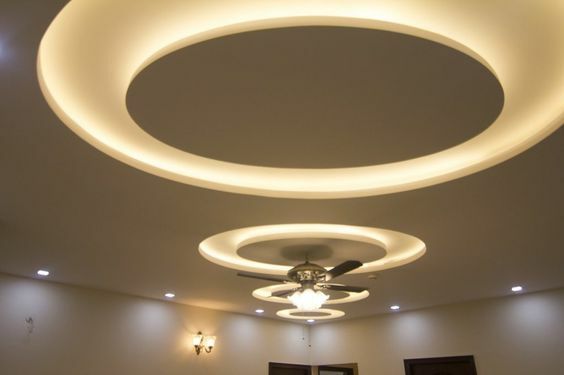 Let's consider in detail how to make a false ceiling and mount the lighting. 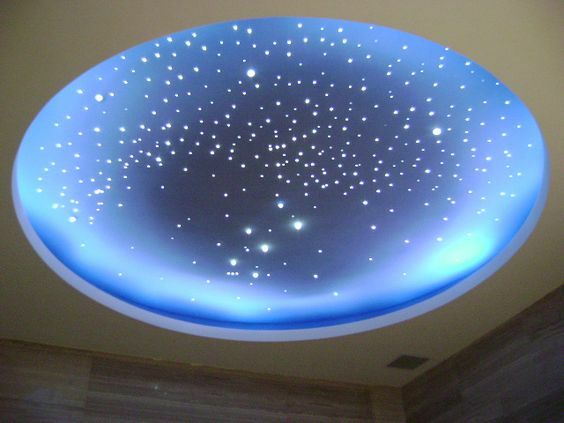 Modern design solutions offer a wide variety of ceilings with the use of different materials. 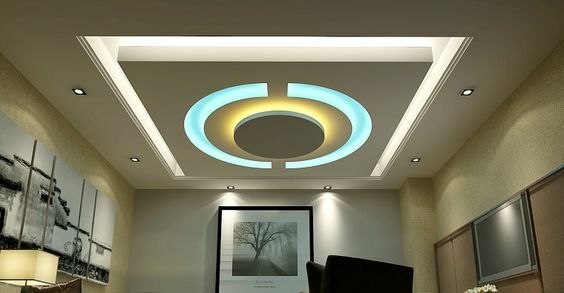 Recently, ceilings from plasterboard with built-in lighting are widely popular. The appearance of such designs is very creative and cute. 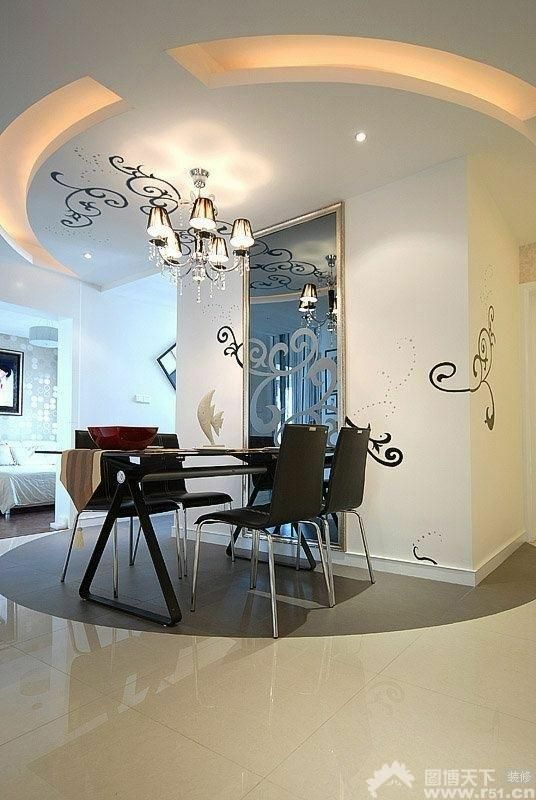 The room acquires an exquisite appearance, and the design idea allows you to make the ceiling original. The ceiling with the use of gypsum cardboard allows to apply various variants of fixtures, to regulate quantity, form, to build in lighting devices based on the taste and preferences. great scope for imagination, the opportunity to make a multi-level project. Let's consider each of the options in more detail. 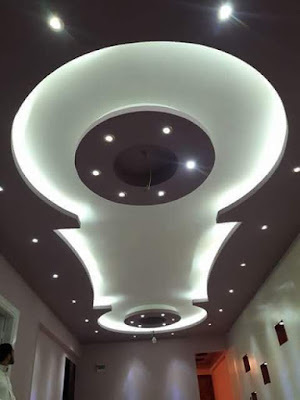 Ceilings from plasterboard - this is an opportunity to turn around and come up with any form of false ceiling. It can be a design with the use of lines, squares, levels, curly parts. Niches and transitions, ledges and decorative fragments are allowed. For a quality result, gypsum boards are attached to profiles that can withstand the construction and strengthen it. The more complex the design, the more fuss for the master, but the result will be pleasing for a long time. To enhance the effect, lighting devices are mounted. Here you can also apply any fixtures. These can be incandescent, LED, halogen or energy-saving fixtures. For rooms with a normal humidity level, standard drywall sheets are used, for "wet" rooms, such as a laundry, bath, pool, it is advisable to use a waterproof material. They can be ordinary waterproof sheets and waterproof super sheets. Mounting material is a noisy and dusty event. To perform the work, you need to invite a specialist if you plan on doing the installation of a false ceiling from plasterboard on your own, invite an assistant, since you will not be able to do this work yourself. Tiled false ceilings are not as cozy as plasterboard constructions. They are recommended to be installed in office premises in storage rooms. The buyer is impressed by the low cost, multifunctionality, fast speed of mounting. There are ordinary plates, there is a water resistant. The downside of this material is its inability to withstand mechanical influences. The material breaks easily when falling. But its low cost balances the lack of such a plan. 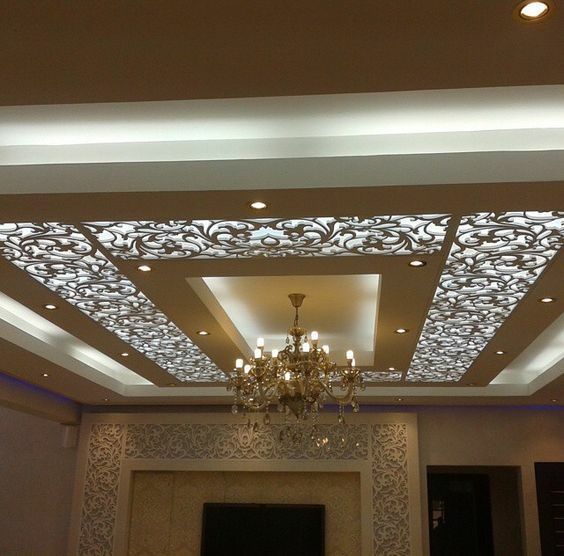 Aluminum ceilings are rails of two types of length: three and four meters. The width of the rails varies from five to twenty centimeters. The material is covered with various shades: for silver, gilding, chrome plated. The surface can be varied - from flat to relief. The lightness of the design makes it possible to install the ceiling without additional fastening, it is durable and gives the room a business look. A similar design is used in non-residential premises. cellular. The use of modular structures makes it possible to level the ceiling, combine shades, create decorative elements and patterns. Such structures are easy to assemble and can be installed independently, as they are relatively light. 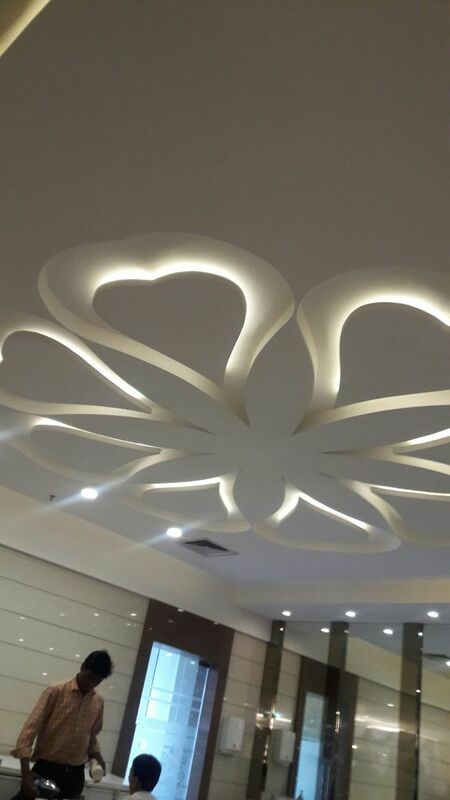 Stretch ceiling requires more attention and detailed description of the structure. 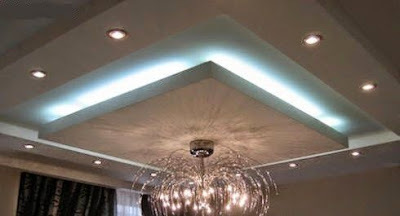 The stretched ceiling is the most popular among all false ceilings. He is in demand and recognized as one of the best. Such ceilings are made of a thin film or fabric, the pattern of which corresponds to the area of the ceiling surface and tightly stretched on a special frame. Depending on the type of material, the construction will glare, shimmer, have a reflective surface or be different from the freshly-ground ceiling. For lighting, light generators are built in. Stretch constructions are in great demand because a wide variety of materials allows you to create different surfaces to taste, the room is transformed, looks luxurious and exquisite. the surface of the false ceiling is impregnated with the means. Which repels the dust, as a result, to care for the surface is very easy, if necessary, you can use a wet sponge, it does not hurt the surface. 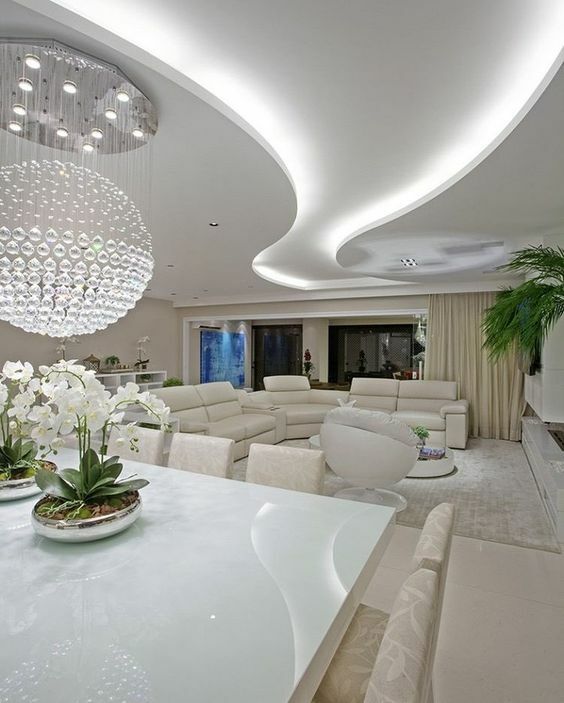 In a room with such a design, it is very light, because it reflects and enhances the light. 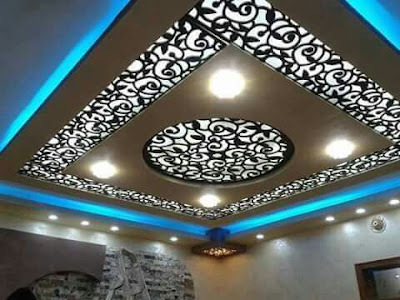 Installation of any type of ceiling coating implies the work of at least two, independently, and even a beginner, do such manipulation is not recommended. possibility to hide the wiring, hatches. 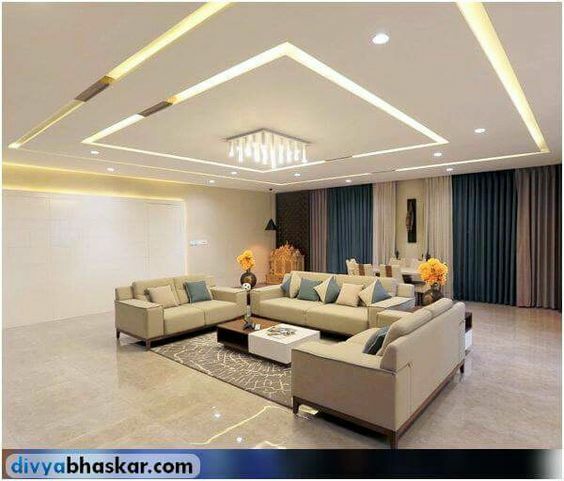 Gypsum plasterboard material is perfectly combined with other types. A varied design idea is possible. fiber optic - these lamps allow you to create effects, are expensive, installed with great effort, take the height of the room. 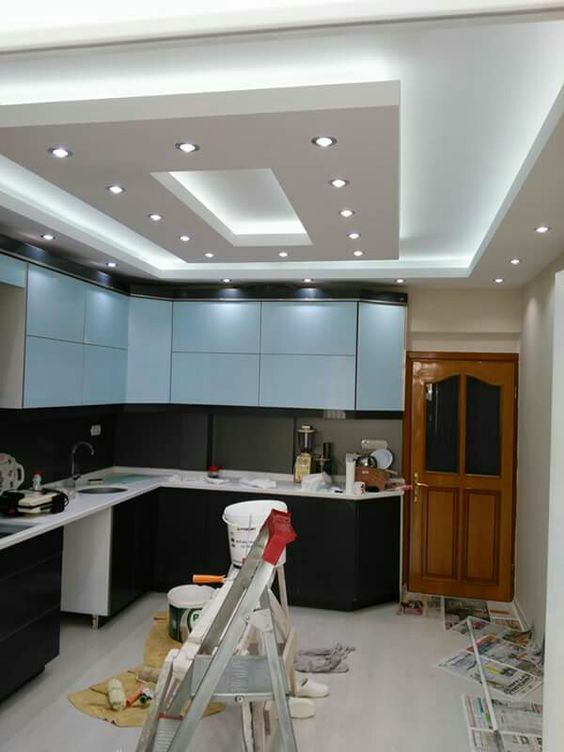 Before installation of devices, it is necessary to make the detailed plan on which it is necessary to note type, the sizes, an arrangement of lighting devices and switches. Implement the first option is easy enough: a vacuum is made in the ceiling and a lighting device is installed. The total weight of lighting devices should not exceed ten kilograms since the ceiling will not withstand the load. 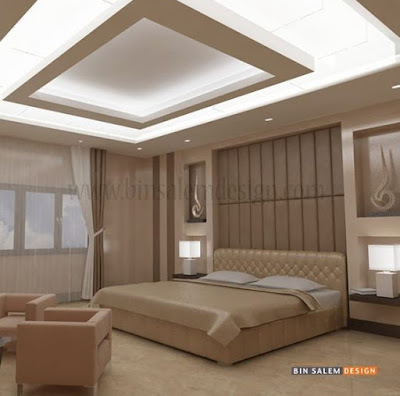 For the second option, it is proposed to install lamps in a special niche between sheets of gypsum board. This option looks very good since the stream of light is directed clearly down. false ceiling independently, with their own hands, is not easy to establish. If you are determined to do this without involving specialists, you need to familiarize yourself with the theoretical basis and try to see firsthand how others do it. For the successful implementation of the work, it is necessary to calculate the amount of material required, prepare tools, and plan the placement of lighting equipment. between the main parts of the profile correctly arrange the jumpers. The resulting frame is covered with sheets, fixed with self-tapping screws. installation and connection of devices for lighting. For general lighting, central lights are used, for detailed - zone lighting as needed, and lighting for moods can create any situation - working, intimate, festive. 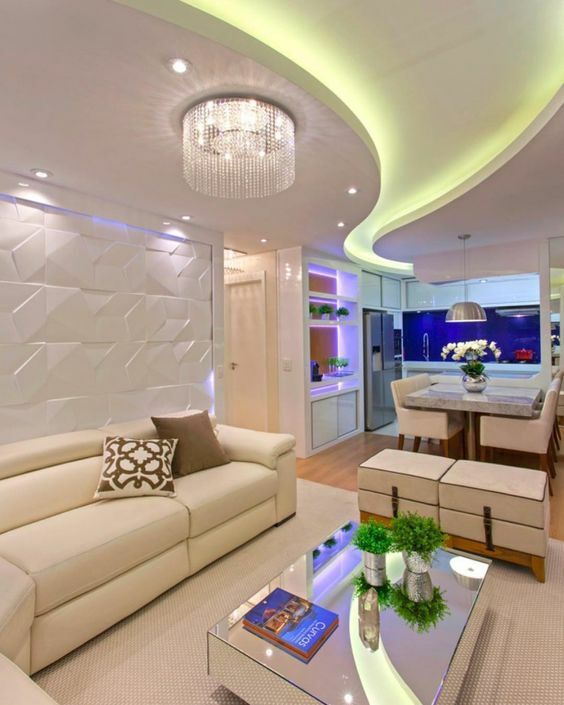 Make your home original and stylish with false ceilings and lighting. A wide variety of materials makes it possible to create masterpiece designs that will be in a single copy. To get acquainted with the options of false ceilings, the algorithm for setting the lighting, the peculiarities, and variety of lighting devices, you can find answers to all the questions in the video and you will be able to see with your own eyes that the false design with lighting is very beautiful and creative.